The threat group responsible for the recently uncovered attack involving a piece of malware known as Triton, Trisis and HatMan is still active, targeting organizations worldwide and safety systems other than Schneider Electric’s Triconex. The actor, which industrial cybersecurity firm Dragos tracks as Xenotime, is believed to have been around since at least 2014, but its activities were only discovered in 2017 after it targeted a critical infrastructure organization in the Middle East. The attack that led to the cybersecurity industry uncovering Xenotime was reportedly aimed at an oil and gas plant in Saudi Arabia. It specifically targeted Schneider Electric’s Triconex safety instrumented systems (SIS) through a zero-day vulnerability. The targeted organization launched an investigation and called in FireEye's Mandiant after the SIS caused some industrial systems to unexpectedly shut down. Researchers believe the shutdown was caused by the attackers by accident. 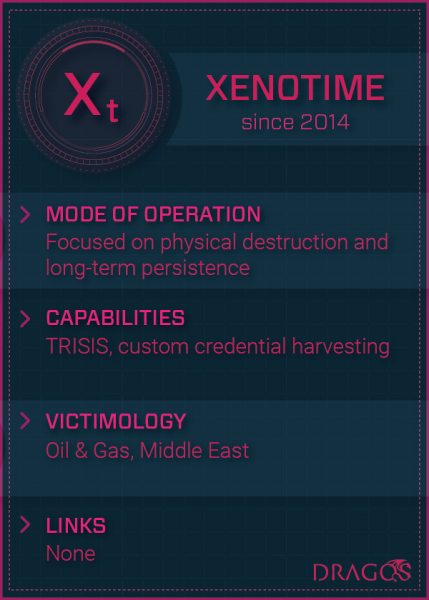 Dragos has also analyzed the initial Triton/Trisis incident and more recent attacks launched by Xenotime. The company says the group has targeted organizations globally, far outside the Middle East. The security firm has not shared any details on present attacks, but it did note that the hackers are active in multiple facilities, targeting safety controllers other than Triconex. Some researchers believe Iran is behind the attacks, but Dragos has not shared any information on attribution. The company did point out that it has not found any links between Xenotime and other known groups. Dragos has been tracking the activities of several threat actors that target industrial control systems (ICS). The company has published brief reports for three of the seven hacker groups it monitors, including the Russia-linked Allanite, which targets electric utilities in the US and UK, and Iran-linked Chrysene, which has attacked ICS networks in the Middle East and the UK.